Editors Note: Below is an interesting Op-Ed from the New York Times (July 1, 2017), by Nicolas Kristof, who found himself inspired in Liberia, a country that has very special resonance for the Society of African Missions. We may not entirely concur with some of the nuances of his optimism, or the metrics of the World Bank, but his emphasis on Good News, Hope and Inspiration, found in Liberia, is certainly refreshing. Of course, we cannot be blind to other headlines such as: “Reality of the worst drought since 1945 peaking in parts of Africa” from africanews. The article states: “Millions of people in over a dozen countries in the Horn of Africa and southern Africa are facing the peak effect of severe drought that hits the regions resulting in famine.” You may read the full article by clicking here. Nonetheless, what Kristof highlights is that there is great hope and heroism in Africa as SMA missionaries can attest to. Given the opportunity to survive and achieve their basic human rights, African people can be sources of inspiration to themselves and the world. In that context, let us reflect on what Nicolas Kristof discovered in Liberia. 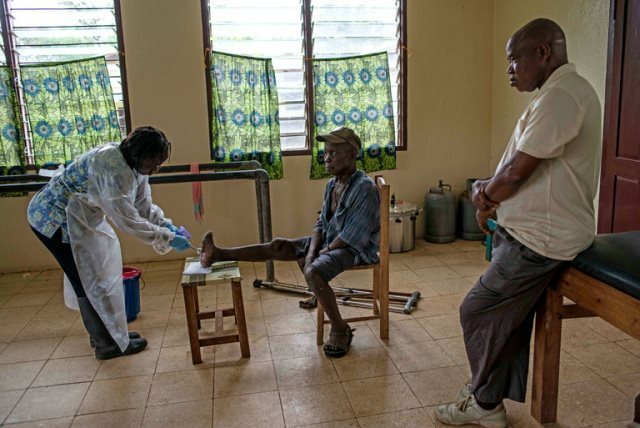 John Brimah, right, cured of leprosy as a child, now oversees the Ganta Leprosy and TB Rehab Centre in Liberia. Together in Liberia, Aneri and I saw children missing school or suffering from excruciating ailments, but the larger narrative is the opposite — less death and more literacy.Journalists and aid organizations need to highlight conflicts, disease and suffering, but we also need to acknowledge the backdrop of progress. Otherwise, people perceive global poverty as hopeless and simply tune out.